The late bodybuilder Rich Piana has left an impressive legacy. We’re talking about Rich Piana 5% Nutrition ALLDAYYOUMAY, one of the most intriguing post-workout supplements on the market. This review takes you through the valuable details. Great ingredient combo. As comprehensive as it gets. Excellent source of Vitamin B12. No other post-workout comes close. Has proprietary blends. Not a good marketing tactic at all. Other Ingredients: Natural Flavors, Citric Acid, Glucose Polymers, Acesulfame Potassium, Sucralose, Silicon Dioxide and Blue #1. We’ve seen our fair share of the most interesting bodybuilding post-workout supplement names. MHP DARK MATTER and SNAC PROGLYCOSYN first come to mind, to be honest. At first glance, you wouldn’t think they’re recovery supplements – they seem more like weird concoctions. Now, we’ve stumbled upon a more unique post-workout product name. Enter Rich Piana 5% Nutrition AllDayYouMay. If that doesn’t grab your attention, nothing will. The inspiration behind this post-workout is the late Rich Piana, an actor and bodybuilder who competed in several NPC bodybuilding contests in the early 2000s. “ALLDAYUMAY was birthed from Rich Piana’s philosophy that supplements should never take the place of your meals, but rather taken in addition to the food you eat,” per the manufacturer’s official website. “ALLDAYUMAY is one of the most dynamic products on the supplement market today, formulated to aid your muscle-building efforts in numerous ways,” per the same source. Rich Piana 5% Nutrition AllDayYouMay is one of the most unique post-workout supplements today. We give props to Piana and Co. for reminding everybody about proper supplement intake. Far too many individuals go overboard. Supplements are just that – supplements. They help fill those nutrition gaps. As for Rich Piana 5% Nutrition ALLDAYYOUMAY, it should be a heaven-sent for those seeking to build lean muscle mass and recover from a hard workout. Just a hunch, but we feel the company named the supplement “ALLDAYYOUMAY” because you can take it any time of day, especially if you need a BCAA fix. That’s fine, but we feel Rich Piana 5% Nutrition ALLDAYYOUMAY is also a great post-workout option. Our first impression: the ingredients are impressive, but there are far too many proprietary blends – the manufacturer lists the total blend amounts, but fails to list those for each component. It bears repeating: proprietary blends are nothing more than a shady and deceiving marketing tactic. Manufacturers must be honest with their customers. Nonetheless, let’s see if Rich Piana 5% Nutrition ALLDAYYOUMAY’s other facet can pick up the slack. The star of the show here is the BCAA BLEND which follows a 10:1:1 ratio and takes up six grams per 15.5-gram scoop. Like we said, the company didn’t reveal most of the individual ingredient amounts. So, we did the math for you: Rich Piana 5% Nutrition ALLDAY YOUMAY’s BCAA breakdown is five grams of leucine, 500 grams of isoleucine, and 500 grams of valine per serving. Five grams of leucine per serving is impressive. In fact, it’s one of the highest we’ve seen for a post-workout supplement. That’s saying a lot. Remember, leucine is the key to muscle-building – this BCAA helps kickstart muscle protein synthesis. On the other hand, isoleucine helps restore a positive nitrogen and protein balance for more muscle growth – a perfect complement to leucine. It also helps repair muscle tissue and increase energy levels. For its part, valine helps increase endurance, repair muscle tissue, and regulate the immune system. We’re not that thrilled with the 500 grams of each per serving – ramping them up to one gram per serving or so would have been better. Despite the somewhat low isoleucine and valine content, Rich Piana 5% Nutrition ALLDAYYOUMAY’s superior leucine component should help you in your long-term muscle-building quest. Rich Piana 5% Nutrition ALLDAYYOUMAY also has 155 milligrams of its ESSENTIAL AMINO ACID BLEND per serving. We can tell you right now essential amino acids (EAAs) have excellent post-workout benefits. For instance, l-phenylalanine helps metabolize fat and enhance mood. Another component is l-threonine, which helps strengthen tissues and connective muscles. As for l-histidine, it helps repair muscle tissue and shore up the immune system. The final essential amino acid component is l-methionine, which plays a key role in producing protein molecules. More importantly, Rich Piana 5% Nutrition ALLDAYYOUMAY has seven of the nine essential amino acids. Remember, your body doesn’t synthesize EAAs. You must obtain them from whole foods or supplements. This product provides your body with these EAAs. We’re confident they’ll go a long way. The second-biggest ingredient group is the Conditionally Essential Amino Acid Blend, which takes up 2.8 grams per 15.5-gram scoop. Here, you’ll find the common post-workout ingredients l-glutamine, l-carnitine l-tartrate, and n-acetyl l-cysteine. Plus, “L-glutamine supplementation resulted in faster recovery of peak torque and diminished muscle soreness following eccentric exercise,” per the October 25, 2015 issue of the International Journal of Sport Nutrition and Exercise Metabolism (via NCBI.NLM.NIH.gov). Glutamine is the most abundant amino acid. Bodybuilders have been supplementing with it since the Golden Era of Bodybuilding. The impressive results speak for themselves. However, judging from the 2.8 grams of the Conditionally Essential Amino Acid Blend per serving, Rich Piana 5% Nutrition ALLDAYYOUMAY’s glutamine content isn’t enough (bear in mind some post-workouts such as PVL TOTAL RELOAD have four grams of l-glutamine per serving). At least this product also has l-carnitine l-tartrate, another proven post-workout ingredient. You can see for yourself l-carnitine l-tartrate is another bona fide post-workout superstar. We’re sure glad it’s in Rich Piana 5% Nutrition ALLDAYYOUMAY. The third component of the Conditionally Essential Amino Acid Blend is n-acetyl l-cysteine (NAC). “NAC is one of the most powerful liver support ingredients available on the market,” per the company’s website. Once again, we tip our hat off to the manufacturer for opening the eyes of the regular consumer – pro bodybuilders tend to put too much stress on their livers because of their lifestyle. Long story short, NAC boosts your liver’s defense mechanism. What’s more is it also restores healthy glutathione (a potent antioxidant) levels, per Rich Piana 5% Nutrition’s official website. These are tremendous benefits, to say the least. We came away impressed with the Conditionally Essential Amino Acid Blend. Not too many competitors have this combination. We suggest you take advantage of this valuable opportunity. Next up is 960 milligrams of the Amino Acid Support Blend per serving. As the name implies, these ingredients complement Rich Piana 5% Nutrition ALLDAYYOUMAY’s amino acid components. Here, you’ll also see some familiar post-workout superstars. L-taurine is a beta amino acid which helps enhance cognitive function, improve sleep quality, boost heart health, shorten recovery time, increase testosterone levels and fat loss, improve insulin sensitivity, and ward off oxidative stress. It’s one of the most versatile bodybuilding supplement ingredients. We like the inclusion of raw coconut water concentrate, which has an impressive electrolyte profile (particularly potassium). This will boost your hydration after a tough workout. We feel coconut water is underrated. More manufacturers should use this instead of those nasty artificial food colorings. Rich Piana 5% Nutrition ALLDAYYOUMAY also has alpha-hydroxyisocaproic acid, or HICA for shot. Simply put, this is the metabolite of leucine which “tells your cells to start building muscle,” per the company’s website. HICA is a perfect complement to any post-workout supplement. As for bromelain, it’s a by-product of pineapple which helps speed up protein digestion and keep joint discomfort at bay – two more important post-workout benefits. Rich Piana 5% Nutrition ALLDAYYOUMAY’s Blue Raspberry flavor also has microdried blueberry fruit powder. This is a post-workout supplement with the antioxidant benefits of blueberries. It helps keep free radicals in check. It also helps ward off muscle tissue damage, fatigue, and muscular discomfort. Plus, blueberries are an excellent way of boosting your eyesight. We give a thumbs-up to the Amino Acid Support Blend. These are a sure-fire way to help you achieve your short- and long-term fitness goals. Rich Piana 5% Nutrition ALLDAYYOUMAY’s creatinol-o-phosphate and beta-alanine components should help keep you going at the gym. Rich Piana 5% Nutrition ALLDAYYOUMAY’s Intra-Cellular Buffer Blend takes up 1.5 grams per 15.5-gram serving. At the forefront is creatinol-o-phosphate (also known by its brand name CopMax). This is a unique creatine derivative which acts as “a buffer that prevents a drop in pH so you can keep pushing that muscle beyond the normal fatigue range,” per the manufacturer’s official website. 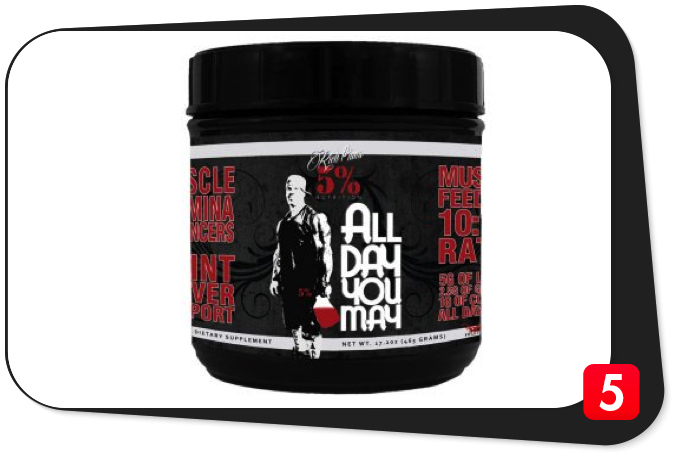 Rich Piana 5% Nutrition ALLDAYYOUMAY is one of the rare post-workouts which has CopMax. Better seize the opportunity. The company also correctly points out creatinol-o-phosphate works great in conjunction with beta-alanine, another post-workout superstar. This product features CarnoSyn, the best brand of beta-alanine on the market. Beta-alanine helps increase muscle carnosine levels, which keeps lactic acid buildup and decreased pH levels in check. The result: you’ll recover faster and be able to train longer and harder. The impressive combination of creatinol-o-phosphate and beta-alanine should help rev up your engine for years on end. Expect increased workout productivity over the long haul. Finally, Rich Piana 5% Nutrition ALLDAYYOUMAY’s Joint Support Blend takes up 600 milligrams per 15.5-gram serving. D-glucosamine sulfate potassium helps keep cartilage breakdown at bay. For its part, methylsulfonylmethane (MSM) helps repair muscle and joint tissues, per the manufacturer’s official website. You can clearly see Rich Piana 5% Nutrition ALLDAYYOUMAY takes a no-prisoners approach in terms of post-workout objectives. It covers just about all the bases in ways which other competitors couldn’t. It’s one of the most unique (and tastiest) bodybuilding supplements on the market today. Vitamin C (as ascorbic acid), 200 mg: Rich Piana 5% Nutrition ALLDAYYOUMAY is teeming with ascorbic acid at an impressive 333 percent of the daily value. Not only will you be able to ward off the common cold, but you’ll also enjoy increased energy levels, improved heart and eye health, and healthier blood pressure levels. Vitamin B6 (as pyridoxine hydrochloride), 2 mg: This product is also a great source of Vitamin B6 at 100 percent of the daily value. Vitamin B6 helps improve cardiovascular, digestive, immune, muscular, and nervous system function. Vitamin B12 (as cyanocobalamin), 125 mcg: No other post-workout supplement comes close to Rich Piana 5% Nutrition ALLDAYYOUMAY’s Vitamin B12 content, which is equal to an insane 2,083 percent of the daily value for cyanocobalamin. This vitamin helps increase energy and decrease fatigue. It also helps regulate the nervous and digestive systems. L-leucine: The most anabolic amino acid is your key to muscle growth. After taking a hint from the 10:1:1 BCAA ratio, we did the math and discovered Rich Piana 5% Nutrition ALLDAYYOUMAY has five grams of leucine per serving. That much is one of the highest for a post-workout supplement. L-isoleucine: The perfect complement to leucine because of its its ability to tilt the protein and nitrogen balance in your favor. L-isoleucine also helps repair muscle tissue and increase energy levels. This product has 500 milligrams of isoleucine per serving. L-valine: The BCAA which helps repair muscle tissue, increase endurance, and regulate the immune system. Based on our computation, this supplement has 500 milligrams of valine. L-phenylalanine: An essential amino acid which helps metabolize fat and enhance mood. L-threonine: Helps produce connective tissue (also known as collagen). It also supports immune and bone health. L-histidine: Helps repair muscle tissue and strengthen the immune system. L-methionine: An essential amino acid which helps build protein molecules. L-glutamine: The most abundant amino acid which helps preserve muscle mass, increase HGH levels, and regulate the digestive system. L-carnitine l-tartrate: Also known as LCLT, this amino acid compound helps torch fat, improve anabolic hormone response, and prevent the buildup of lactic acid. N-acetyl l-cysteine: This ingredient is also known as NAC. It helps protect the liver and increase glutathione levels. L-taurine: An amino acid which helps metabolize fat, lower stress levels, improve insulin sensitivity, and reduce oxidative stress. Raw coconut water concentrate: Coconut water is rich in electrolytes (especially potassium), which help make it an attractive option after a hard workout. Alpha-hydroxyisocaproic acid (leucic acid): HICA is a leucine metabolite which gives your cells the go signal to build muscle. Bromelain: A by-product of pineapple which helps improve digestion and ward off post-exercise joint discomfort. MicroDried blueberry fruit powder: Helps ramp up your antioxidant levels for improved resistance against fatigue and muscle tissue damage. Creatinol-o-phosphate (CopMax): A derivative of creatine which acts as “a buffer that prevents a drop in pH so you can keep pushing that muscle beyond the normal fatigue range,” per Rich Piana 5% Nutrition’s official website. Beta-alanine (CarnoSyn): Increases muscle carnosine levels for reduced lactic acid buildup, increased athletic performance, and improved exercise performance. D-glucosamine sulfate potassium: Helps repair cartilage to stop post-exercise breakdown. Methylsulfonylmethane (MSM): A rich source of sulfur which helps repair and regenerate damaged muscle tissue. Well, it sure seems to us Rich Piana 5% Nutrition ALLDAYYOUMAY is more than just a supplement you can take any time of day, it’s also a valuable post-workout product. Look no further than its comprehensive ingredient profile as hard evidence. For starters, we like its five grams of leucine per serving. This is one of the highest amounts for a post-workout product, so we’re confident you will build valuable muscle mass. On the flip side, the 500 milligrams each of isoleucine and valine are somewhat lackluster. Perhaps ramping them up to one gram of each would have been better. The inclusions of l-glutamine, l-carnitine l-tartrate, and n-acetyl cysteine were also no-brainers: these are staple post-workout ingredients which can give you serious results. Like we said, the lack of l-glutamine gnaws at our conscience. Many post-workouts have at least five grams per serving. You’ve seen how versatile this amino acid is. Too bad there isn’t enough in Rich Piana 5% Nutrition ALLDAYYOUMAY. In this case, more would have been better. The Intra-Cellular Buffer Blend, with its CopMax and beta-alanine (CarnoSyn) components, is just as impressive. We are confident these will help shorten recovery time and enable you to work out longer and harder. The other blends (Essential Amino Acid Blend, Amino Acid Support Blend, and Joint Support Blend) also play great complementary roles. We’re particularly impressed with the inclusions of l-taurine, raw coconut water concentrate, HICA (leucic acid), microdried blueberry fuit powder, d-glucosamine sulfate, and MSM. If these don’t help take your recovery to the next level, we don’t know what will. Plus, this supplement is teeming with Vitamin C, Vitamin B6, and Vitamin B12. Many post-workouts include these to boost your recovery even more. We’re glad this product is no exception. It bears repeating: Rich Piana 5% Nutrition ALLDAYYOUMAY is the king of Vitamin B12 among post-workout supplements (a whopping 2,083 percent of the daily value). Only select multivitamins can measure up. That’s impressive, to say the least. Many customers have also sung this supplement’s praises. They say it helps shorten their recovery time. It also helps them achieve their fitness goals. Plus, they couldn’t get enough of it – they say it’s easy on the taste buds. We agree. It’s one of the best-tasting post-workouts out there. As great as Rich Piana 5% Nutrition ALLDAYYOUMAY’s ingredients are, it’s not a perfect product. We already stressed the manufacturer resorted to shady proprietary blends. This product has a total of six, to be precise. Rich Piana 5% Nutrition ALLDAYYOUMAY’s blueberry flavor also has a dirty ingredient: FD&C Blue No. 1. Experts have linked this artificial food coloring to several side effects. We give that a huge thumbs-down. This product also contains sucralose (a.k.a. Splenda), an artificial sweetener which has ties to obesity. Stevia, a natural sweetener which helps regulate blood pressure levels, would have been the better option. After checking this supplement’s five other flavors, we discovered the Southern Sweet Tea version is the only one which doesn’t have any artificial food coloring. That could be your best bet. Lastly, Rich Piana 5% Nutrition ALLDAYYOUMAY doesn’t come cheap. A 17.2-oz. (465-gram) container costs $37.95. Most of the ingredients are top-notch, so we’re not surprised one bit. Rich Piana 5% Nutrition ALLDAYYOUMAY is one of the most unique post-workout supplements today. Its impressive ingredients work synergistically to produce the best possible results. It may have a few chinks, but it’s worth it. We agree with all of these claims. Rich Piana 5% Nutrition ALLDAYYOUMAY can help you achieve your post-workout goals, and then some. The manufacturer intended Rich Piana 5% Nutrition ALLDAYYOUMAY for healthy and active individuals who are at least 18 years old who want to build muscle mass, increase endurance, shorten recovery time, achieve their daily fitness goals, and boost their long-term health. Rich Piana 5% Nutrition ALLDAYYOUMAY (except the Southern Sweet Tea flavor) includes artificial food colorings, which experts have linked to certain side effects. It also has sucralose (a.k.a. Splenda), an artificial sweetener which experts have linked to weight gain. If these, or any other ingredient, makes you feel doubtful, please consult your physician before buying Rich Piana 5% Nutrition ALLDAYYOUMAY. Impressive ingredient combo. Help build muscle mass, increase endurance, and shorten recovery time. 10:1:1 BCAA ratio. Heavy emphasis on leucine, the most anabolic BCAA. Teeming with bonus ingredients. Incredible source of Vitamin C, Vitamin B6, and Vitamin B12. King of Vitamin B12 among post-workouts. Whopping 2,083 percent of the daily value. Good reputation. Many consumers have given it decent online reviews. Awesome taste. Customers say it’s easy on the taste buds. We agree wholeheartedly. Flavor options. Comes in Blue Raspberry, Fruit Punch, Lemon Lime, Mango Pineapple, Watermelon, and Southern Sweet Tea varieties. Mediocre glutamine amount. Could have been more. Proprietary blends. Manufacturer includes six in all. Thumbs down. Dirty ingredient. All flavors execpt the Southern Sweet Tea version have artificial food colorings. Somewhat expensive. $37.95 for a 17.2-oz. (465-gram) container. Not only does Rich Piana 5% Nutrition ALLDAYYOUMAY have one of the most intresting names, but it also has one of the most impressive ingredient profiles among post-workouts. Throw in a 10:1:1 BCAA ratio, great complementary ingredients, and an awesome vitamin profile, this supplement can help you achieve your fitness goals and then some. Unfortunately, the product’s proprietary blends, dirty ingredient, and somewhat expensive price pull its value down. Clearly, this product has some chinks. However, you can still give it a shot. If it doesn’t meet your expectations, there are plenty of better post-workouts out there.